Unlike other articles on this site, we decided to answer some common question we receive on a daily basis regarding the drone set-ups, our fleet of drones and the technology behind these machines. You might have already viewed our drone videos on Youtube or seen our photos on Google maps. If not, the links are displayed below as examples of drone aerial video and photography. We currently use the standard DJI Pahantom original version. Yes! Original. We’ve flown these drones for the past 3 years and modified it to suit our needs. There are plenty of articles and forums online where we have contributed and gained valuable knowledge from other users about flying these machines to take advantage of technology and photography skills. The set-ups might be basic but they have been fined tuned to offer us an easy way to fly and capture the image with as little effort as possible. Update: See Bendigo Aerial for Drone Photography and Aerial Video Cinematography services. We have updated this article and our fleet of drones. With the after market gimbal, gopro camera and FPV equipment the drone flight time is reduced to approximately 7 – 8 minutes. This time includes waiting for the GPS fix and pre-flight checks once the rotors are turning. This gives us plenty of time to get that perfect photo or a run a series of videos to compile later. We usually photograph in Central Victoria and around the Bendigo region. Lakes, reservoirs, landscapes and mountains are generally our theme; however most of the footage was captured while testing the drone with different equipment. 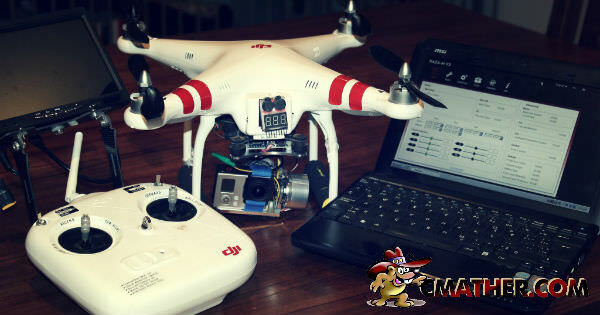 Quatcopter and Drone Setup with 7″ TFT Screen. Drone Setup and Equipment Used: (Updated List). Running the latest Naza software with some tweaks. Added a battery warning checker to the battery door. When the battery gets low, a loud audible beep is heard so you can land the aircraft as quickly as possible. This is also a great way to check the battery for full charge prior to takeoff. Bought on eBay for a few dollars. Gimbal: Cheap after market gimbal was purchased from eBay for around $50.00. Lessons learnt we won’t do this again and invest in a proper Zenmuse or similar gimbal. The cheap eBay gimbal does work however we had to configure, test and make software changes to get it to work to our requirements. Currently this gimbal will take steady video, however on windy days it’s a waste of time. After some effort we have programmed our gimbal to shoot a range of 90 degree views. We use after market batteries: Turnigy 2200mAh 3S 30C Lipo Pack, purchased from Hobby King. This is a great replacement to the standard DJI battery. To make the landing a little smoother we added a protective foam. Search ebay for: “Landing Gear Protective Foam Protector For DJI Phantom Quadcopter” around $2.00 a pair. We always film in 1980 x 1440 X 48fps. This way in post production you can simply cut the propellers out of the scene or play around with the height of the video to get the best picture. We set the GoPro camera to always shoot with “ProTune” turned on by default. Removed fish eye effect in post production software or use the GoPro Studio to convert the video. Added a GoPro Sun Shade Cover to stop video interferences from props vs the sun. Looking into the sun will cause ripples in your video. Can make your own with a piece of cardboard or buy cheap on eBay. For photos, we set the GoPro to take a picture every 2 seconds. If turning Protune to off, you can also take video and photos at the same time. GoPro Hero 3 to FPV Transmitter Lead – 200mm from Hobby King to send video from the GoPro to the FPV transmitter. Fatshark Predator V2 Goggles. We tried a few different options and this is by far the best option for us. Search: FatShark PredatorV2 RTF FPV Headset System w/Camera and 5.8G TX. ImmersionRC 5.8GHz Circular Polarized SpiroNet Antenna V2 (RHCP SMA). This was used to replace the existing Fatshark Predator antennaas as we found these gave the best range without any static through the frequency. A cheap 7″ inch video screen to relay video so others who had no access to the goggles could see. We set-up the monitor on a tripod and used the existing cables provided with the Fatshark to set this up. The 7″ inch screen runs on it’s own power source. GoPro Studio: Import and convert the protune video, remove fisheye effect. We may also use it to cut sections before importing HD Video. Magix Movie Editor Pro 2015: We use this software for all our edits. Import the protune videos from Gopro studio, edit videos using a storyboard. Resize clips back to 1080 and export to various formats for Youtube, Instragram and other platforms. All our images and videos can be found online. We belong to many of the forums, directories and online drone portals. Listed below are some of the many videos from Youtube. We have also listed where you can see some of the drone images we have taken throughout the years. Online drone Communities we are actively involved with. We place all our HD video, pictures and live footage to these distribution sites. The sites are organised with Google maps and is a great way for us to show our work to the public. Want to use our drone images or video? All images are free to use and available to the public online. There is no cost, however permission is required prior to use. We would appreciate an email to inform us of the usage and credit where due so we can keep track of the video / photo and possible showcase it on our sites. A lot of time and effort is taken in producing and photographing locations throughout Australia. Side note: All video and photography is taken in a controlled environment. Always fly responsibly without breaking any laws. If considering taking up this hobby it’s always best to check with current CASA regulations and standards. The usage of drones has increased over the past year and with the increased amount of drones in the air, you can bet the rules and standards will become stricter over the coming years.